Most of there diet consists of woody herbaceous forage. According to Anderson and Wellmo (1984) the deer were thought to be browsers but do to physiology that is not the case. The Columbian Black Tail Deer are actually intermediate feeders because do to their short height. The Black Tailed Deer’s diet mainly consists of brome, orchard, blue grass, and woody shrubbery (Millburn 2011). They also like to eat lichens, mushrooms, and some times berries (Millburn 2011). For the main part they often eat at dawn and at night, and when they do they are usually around some type of shrubbery (Millburn 2011). The Black Tailed Deer uses it mainly to feed and it gives the deer a sense of protection (Millburn 2011). When winter comes it is obvious that there is very little food for the most part so what the mule deer in general like to feed on is bitterbrush (Blecich et al. 2004). They take on this alternative diet because in the winter they either have to dig in the snow for grass or they eat the bitterbush. The brush has a high content of moisture and nutrients, compared to that of the other plants in the winter. Mostly what were measured were the moisture levels (1.07%), nitrogen levels (1.97%), and the percent level of abundance (27.95%). The plants can be found wit h constant levels in almost all of the places that it could be found (Blecich et al. 2004). 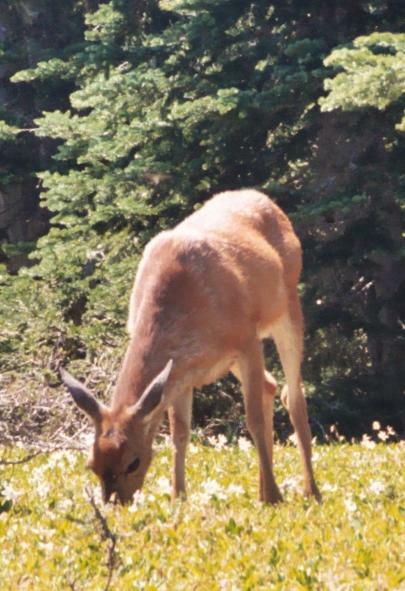 Also in lesser quantities the deer have also been known to eat rabbitbrush, blackbrush, grass, and other respectively in that order but in much less quantities compared to that of the bitterbrush (Blecich et al. 2004). When it comes to feeding the mule deer in general spend about 40-60% of their time feeding and consuming food (Hanley ect. All 2004). In mule deer there was a study done to measure out the amounts of bite they would take according to how moist the matter was and it sees as the moisture there is the more bites (Hanley ect. All 2004). What this means is that when it snows the food level is low like stated before but the ideal time to feed the best would be in the spring. Refresh your memory on the Adaptations page or continue on and learn about Reproduction.